The trade show for LOFA members is called SOLEX. The original announcement was made at a press launch to Trade Press at the Goring Hotel on Monday 2nd July 2007 and the first SOLEX show took place on July 6th to July 8th 2008 and acclaimed a success by the industry. The fifth SOLEX show promises to be even better building on the first 4 successful shows with more exhibition space in a brand new hall, new exciting developments and more exhibitors but retaining the relaxed but business-like atmosphere. 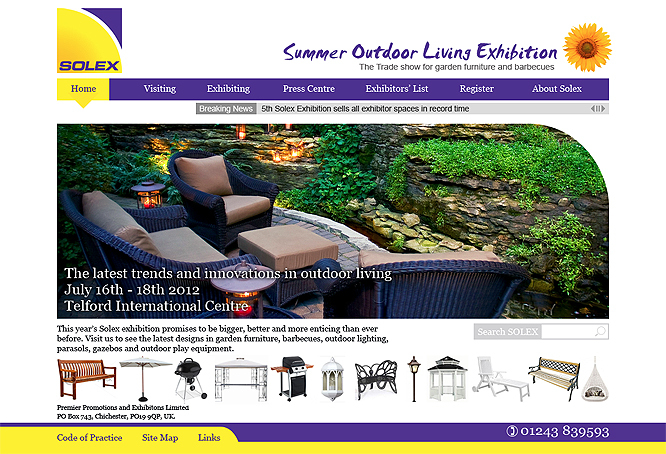 "LOFA, the Leisure and Outdoor Furniture Association, already had a good site from Sure Communication but we both felt that it could be substantially improved. Indeed web sites that don't develop will probably die in the long run. What really worked well was the close working relationship between LOFA and Sure Communication so the site could be tailor made to meet our needs. The innovation in the new site is outstanding but to the users, it is more informative and even simpler to use. All Members can now see who visit their web site and can update it themselves. We now have a true portal site for garden furniture and barbecues."